Recently, internal documents from the Open Society non-profit headed by billionaire George Soros have been released to the public by anonymous hackers and provided in a searchable database. TR’s search of the documents reveal, that in May of this year the Open Society group applauded Mayor Andrew Gillum’s decision to welcome Syrian refugees to the City of Tallahassee. TR has also verified the direct financial relationship between Tallahassee Mayor Andrew Gillum and the George Soros network. 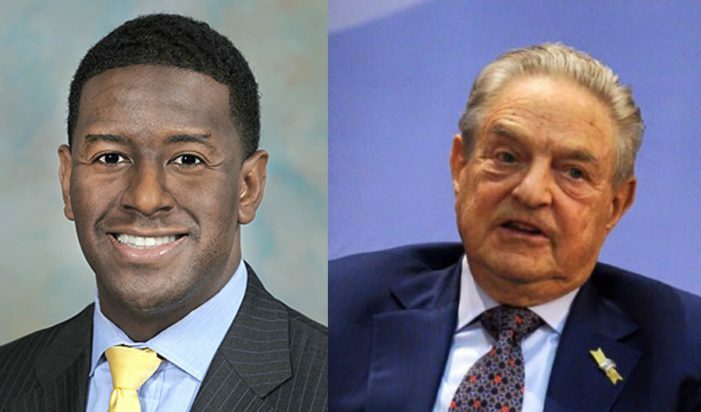 Public documents show that the Soros non-profit Open Society earmarked $700,000 in 2012 to the Gillum run Young Elected Officials Network through the People for American Way Foundation. Gillum receives approximately $150,000 in annual salary from his job with the Young Elected Officials Network. The documents show that Gillum has been involved with the Open Society group since at least 2009. A leaked document, dated May 2016 and entitled “Open Society U.S. Programs Board Meeting”, lays out the groups goal to promote change through leaders at the local level. Also in the document, the writers provided examples of how local governments had supported specific policies that were consistent with Open Society’s positions. Among those examples were Gillum’s public pronouncement on Syrian refugees. Questions have been raised by some about Gillum’s financial arrangement with Soros backed groups and his unilateral policy decisions as Mayor. His public pronouncement on the Syrian refugee issue was done without consultation with the City Commission. Is Mayor Gillum’s financial arrangement with Open Society driving decisions that ultimately impact the City of Tallahassee? Mayor Gillum has been reluctant to talk about his relationship with the People for American Way and George Soros. In fact, in an email he threatened to take legal action against TR over a report discussing his employment with the People for American Way Foundation. 19 Responses to "Leaked Documents Show Soros Group Approved of Gillum’s Position on Syrian Refugees"
Unfortunately, this all seems to be fine and dandy with the citizens of Tallahassee who seem to have their heads stuck in the sand. They will keep on re-electing Gilliam. Gillium needs to be removed from office. Can he be recalled? Gillum & Clinton, both crooks & liars! This is really huge. Explains a lot! Gillum is Obama Jr., and if we don’t wake up this town is the next Ferguson. How on earth does Gillum get away with going against the governor and making decisions about accepting illegal immigrants – mostly military age Muslim men – and without consulting the City Commission!! Please someone, tell us what we can do. This is ridiculous! “Questions have been raised” by whom? So, now we know, Tallahassee is just a temporary stop in the ambition of our esteemed mayor. He cares nothing about Tallahassee except in so far as it can further his political future. We now know he takes his guidance from Soros, not the citizens of Tallahassee or his fellow commissioners. We did it to ourselves by mistakenly believing he was one of us. We now know how wrong we have been. Maybe when our fair city becomes like Detroit, we will remember this day and the man who betrayed us all. It’s the Mayor that went against the governor to allow syrian refugees into our city, if you want to blame someone them blame is on Gillum, he’s the damn traitor. If only enough Tallahassee voters had cared to see the red flags, read the stories here at Tallahassee Reports, and listen to my show…Gillum was always willing to appear on my program until I wanted to ask questions about how his employment with People for The American Way – Foundation would impact his agenda as mayor. He wanted no part in answering the question and has not taken a tough question since. George Soros is an enemy of this nation and his leaked email reveal the extent of his evil intentions here and abroad as well as his close, manipulative relationship with Hillary Clinton. Once again, voter beware. I’m sure you have noticed that even though he is paid out of the PFTAW ‘Foundation’, which is their 501(c)(3) charity, he does no charity work at all…based upon the research I have done. Gillum is an obama acolyte and is determined to emulate obama’s agenda in every way. Thus, Soros is eager to aid Gillum’s ambitions, which mirror those of Soros’ favorite president. Preston Scott is absolutely correct in identifying Soros as an Enemy of America. And if Gillum is actively working with and for the Soros agenda . . . make of it what you will. 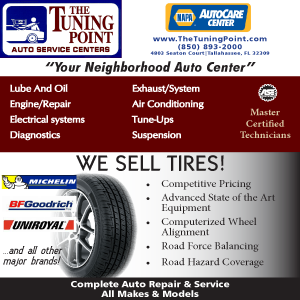 Wake up citizens of Tallahassee and the US! If we allow corruption and under handed dealings then we only have to blame ourselves. Gilliam is a self serving politician who is in cahoots with the enemy of the US. Where are the Commissioners? This is symptomatic of a larger problem and that is the Mayor is more devoted to his job with the FAW than he is with being Mayor. Our only hope now is that if God-forbid that Hillary is elected prez that she’ll take the Mayor and send him to DC to help recreate DC to Moscow-on-the-Potomac. He is so far out-of-step with our city and the direction we need to go in. And when it comes out that his spending within his own office is so far over the top, hopefully Tallahasseans will be upset and demand change. Soros has made a huge contribution to the development of Democracy across the world through his timely efforts and generous contributions. He has done more to ensure freedom in Central Europe than almost any other individual. If one reads something other the works of bigots and right wing trash. There is a chance that a little of this world may be saved for the next generation. The Governor on the other hand with his actions has been successful at turning your clear waters into dollars for his friends and a black cesspool for the public. Just look at the condition of the aquifer under Tallahassee, and the associated surrounding rivers. The mayor should be open with the public. I truly do believe that Soros’ actions will not put the public in chains. He funds Public Society to make this a better place. Correction: The Soros’ Program is called Open Society not Public. Hillary, Bill, Barack and George. Folks, you really do need to do some research on People For The American Way (PFTAW) and their anti American stance on every single issue that you hold dear. They are about as evil as it can get and our Mayor is paid by them to further their causes. He is paid out of the PFTAW Foundation which is the ‘charity’ side of their operation so that he doesn’t run afoul of voting their way and having a conflict of interest regarding their political side. If you were to examine his duties, there is not a single thing he does that involves any charity,under their umbrella. I wonder how he got his Northhampton house valued, for property taxes, at $102,000 less than he bought it for. And why, according to leonpa.org, he’s not claiming a homestead exemption on it. Does he not live here? These City Commissioners are asleep at the wheel. They were elected to guard and promote our best interests. What goes in can certainly be voted out. I hope they’re aware of this! George Soros is unequivocally the most evil man in the entire world with an agenda that, if known to ALL Americans, would make their hair stand up on their arms. He wants to destroy our freedoms and ultimately, our Country!!!! (Please do your research on George Soros if you don’t know his track record). Gillum, either get honest and serve Tallahasseeans in the job you were elected or STEP DOWN. We don’t need more deception and dishonor and this also includes UNVETTED Syrians pouring into our community. Another “enemy within” that needs to be rooted out.